Autograph album kept from the early 1880s through 1926 by Frances E. (Milliken) Leverton, wife of Dr. Charles Henry Leverton, who served as a Methodist minister, before and after his medical career. It appears that Frances married widower Benjamin Herrick Higgins, Jr., after Dr. Leverton's death; more below. 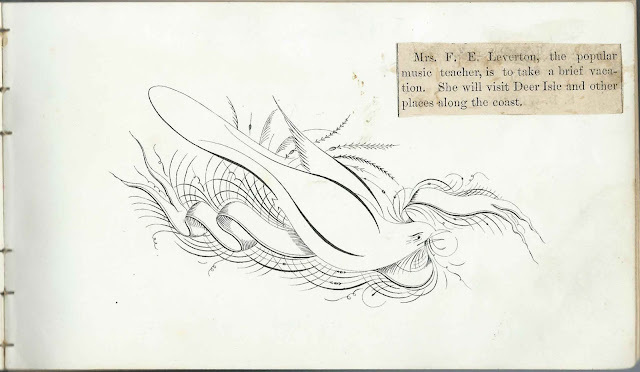 The album measures approximately 7" by 4-1/4" and contains several mementos tucked in and the sentiments of nearly 100 of Frances' relatives and friends in Maine, Massachusetts and England. An alphabetical list of the inscribers, together with any personal information they offered, appears at the end of this post. Frances E. Milliken was born in 1847 in Maine, the daughter of James Augustus Milliken and Lydia Tittle (Dutch) Milliken. Frances's father inscribed the first page in her album at Surry, Maine, on June 12, 1883. Frances had a twin sister, Flora A. Milliken, who married Robert L. Grindle. Flora and Robert inscribed facing pages in the album. Read more about the Milliken family of Surry, Maine, from an article entitled "The Milliken Family of North Bend and the Migration to California" by Dr. Wayne H. Smith in the August 2017 issue of the Hancock Historian, a publication of the Hancock County Genealogical Society. About 1864, Frances, an organist, pianist and music teacher, married Charles Henry Leverton, who was born November 30, 1841 at Portsmouth, New Hampshire. The 1870 Census found the couple living at Richmond, New York, where Charles was serving as a clergyman. It was presumably Charles who was the Charles Henry Leverton who receiveded a degree from the Medical Department of New York University in 1880. The couple then moved to Maine, where Charles practiced medicine in several towns, including Livermore and Mount Desert, and possibly also Searsport and Wiscasset. In 1895, Dr. Leverton returned to his earlier profession of Methodist clergyman and, among other duties, ministered for a year at Princeton, Maine. The General Alumni Catalog of New York University 1833-1907, published in 1908, shows Dr. Leverton as retired and living at Cataumet, Massachusetts, the residence of several inscribers. I didn't find records for any children for Frances and Charles. Charles died in 1908 at Mount Desert, Maine. Frances lived until 1932. A 1923 record shows a marriage at Bar Harbor, Maine, between Frances Leverton - with a variant for Frances Milliken - and Benjamin H. Higgins. I'm assuming that Benjamin was Benjamin Herrick Higgins, Jr., widower of Louisa J. (Lurvey) Higgins. Frances died in 1932; death records give her name as Frances E. Leverton. If the 1923 bride was indeed Frances E. (Milliken) Leverton, she apparently kept or took back the Leverton name after the death of Benjamin H. Higgins, Jr. in 1928. Frances and Charles are buried in the Brookside Cemetery at Somesville, Mount Desert, Maine. Benjamin Herrick Higgins, Jr., is buried in the Higgins Cemetery at Bar Harbor, Maine. 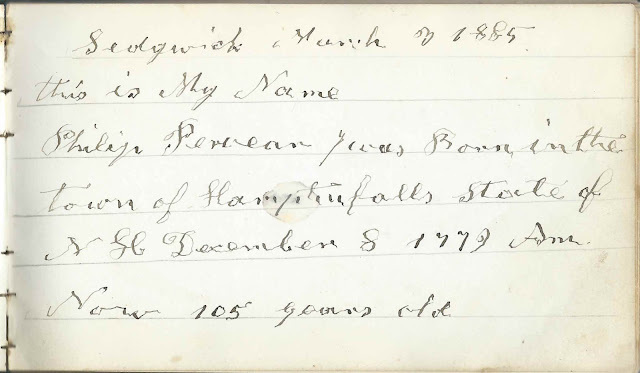 Page inscribed by Philip Pervear of Sedgwick, Maine, who inscribed his page on March 3, 1885, when he described himself as 105 years old, having been born at Hampton Falls, New Hampshire, on December 8, 1779. 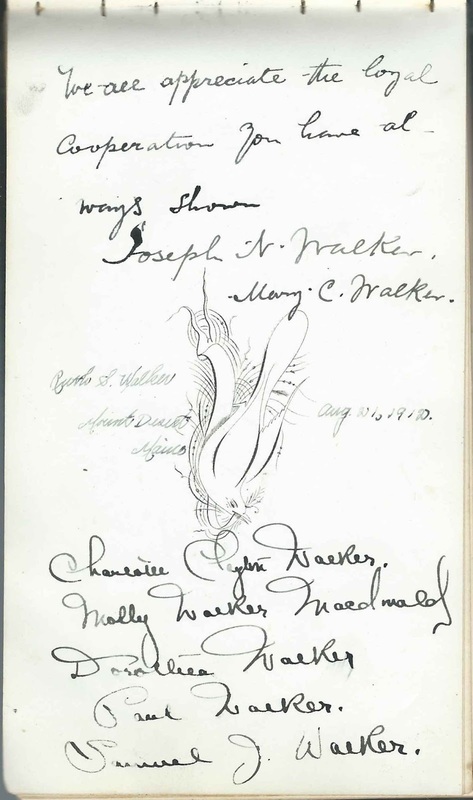 Page inscribed by the Walker family of Mount Desert Island, Maine, with the expression "We appreciate the loyal cooperation you have always shown"; with the names of Joseph N. Walker; Mary C. Walker; Ruth S. Walker of Mount Desert, Maine; inscribed on August 21, 1912; Charlotte Peyton Walker; Molly Walker Macdonald; Dorothea Walker; Paul Walker; Samuel J. Walker. Page inscribed by Sophia A. Towne; inscribed at Beverly, Massachusetts, on August 6, 1883. "Aged 62 yrs". Frances' cousin. She was Sophia A. (Strickland) Towne, wife or widow of Nathan Webster Towne and grandmother of the 4 children named on the overleaf: Willie W. Towne; Georgia J. Towne; Freddie S. Millett; Annie C. Millett. I believe Sophia and Frances were linked by their Tittle ancestors. Newspaper or magazine clipping of photograph of John Edward Nelson, Maine politician, and family. Also tucked in the album are notes from a doctor's lecture, possibly a lecture by Dr. Charles Henry Leverton, and a letter sent from Edinburgh, Scotland to Frances in 1888. Mrs. Mary A. Allen of Sedgwick, Maine; inscribed on May 9, 1993. "age 57". Mary Ann (Wilson) Allen whose husband Charles Crosby Allen inscribed the right facing page. Charles C. Allen of Sedgwick, Maine; inscribed on May 7, 1886. "age 62". Charles Crosby Allen, whose wife Mary Ann (Wilson) Allen inscribed the left facing page. Annie L. Allen of Sedgwick, Maine; inscribed on May 7, 1885. "Age 14"
Robert E. Campbell of Seal Harbor, Maine; inscribed at Wiscasset, Maine, on February 10, 1889. His wife Evelyn (Lynam) Campbell inscribed the right facing page. Evelyn Campbell of Seal Harbor, Maine; inscribed at Wiscasset, Maine, on February 10, 1889. She was Evelyn (Lynam) Campbell, whose husband Robert E. Campbell inscribed the left facing page. Mary Ann Carroll of Southwest Harbor, Maine; inscribed on March 17, 1926. "Born May 7, 1835". She would die a few months later, on November 29, 1926. Earl C. Cook of Cataumet, Massachusetts; inscribed on April 3, 1906. " nine years old". "Born Apr 24 - 1896". Earl spelled Cataumet as Cataunet. He was Earl Clinton Cook, whose sister Blanche Gertrude Cook inscribed the right facing page and whose parents Hattie A. (Shaw) Orcutt Cook and Nathaniel Bartlett Cook inscribed the following facing pages. Blanche Gertrude Cook of Cataumet, Massachusetts; inscribed on April 3, 1906. "ten years old". "Born Nov 15 - 1894". 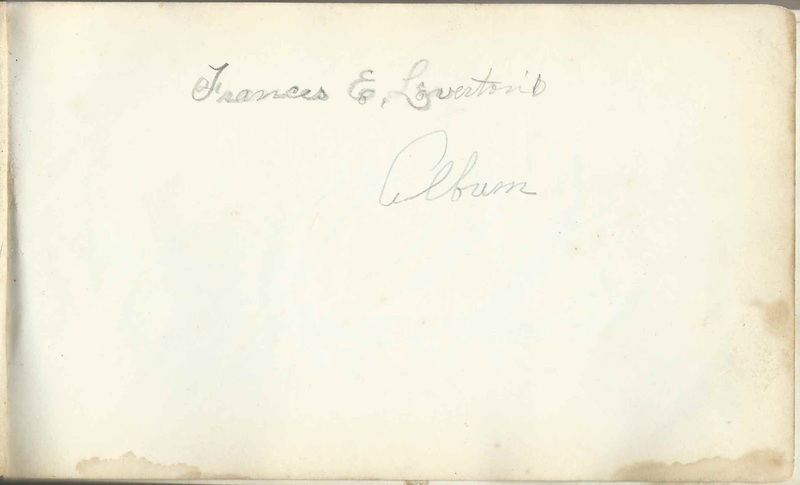 Blanche's brother Earl Clinton Cook inscribed the left facing page and her parents Hattie A. (Shaw) Orcutt Cook and Nathaniel Bartlett Cook inscribed the following facing pages. Hattie A. Cook of Cataumet, Massachusetts; inscribed on April 3, 1906. "Born Apr 13 - 1861" Hattie Allena [or Ellena] (Shaw) Orcutt Cook, whose 2nd husband Nathaniel Bartlett Cook inscribed the right facing page, and whose children Earl Clinton Cook and Blanche Gertrude Cook inscribed the preceding facing pages. Nathaniel B. Cook; inscribed at Cataumet, Massachusetts, on April 3, 1906. "Born May 7 - 1861". His wife Hattie Allena [or Ellena] (Shaw) Orcutt Cook inscribed the left facing page. Their children Earl Clinton Cook and Blanche Gertrude Cook inscribed the preceding facing pages. Rev. Charles W. Dane; inscribed at Livermore, Maine, on April 22, 1901 . Shared the page with his wife Carrie Emma (Curry) Dane, who wrote the name of their daughter Maybelle G. Dane. Carrie E. Dane; inscribed on April 22, 1901 at Livermore, Maine. Carrie Emma (Curry) Dane shared the page with her husband Rev. Charles W. Dane; she also wrote the name of their daughter Maybelle G. Dane. Maybelle G. Dane; her name written by her mother Carrie Emma (Curry) Dane, who shared the page inscribed at Livermore, Maine, on April 22, 1901, with her husband Rev. Charles W. Dane. Alice Elizabeth Eaton of Sedgwick, Maine; inscribed on May 9, 1885. "Don't forget the white store on the right." Evelyn M. Gaspar of Surry, Maine; inscribed on August 7, 1921. She was Evelyn Mary (Bemis) Gaspar, wife of Willie Everett Gaspar who inscribed the right facing page. Willie E. Gaspar of Surry, Maine; inscribed on August 7, 1921. He was Willie Everett Gaspar, husband of Evelyn Mary (Bemis) Gaspar, who inscribed the left facing page. The Gaspar family was related to the Milliken family of album owner Frances E. (Milliken) Leverton. Manford E. Gaspar of Surry, Maine. Shared the page with his brother W. Albert Gaspar. They were the sons of inscribers Willie Everett Gaspar and Evelyn Mary (Bemis) Gaspar. W. Albert Gaspar. 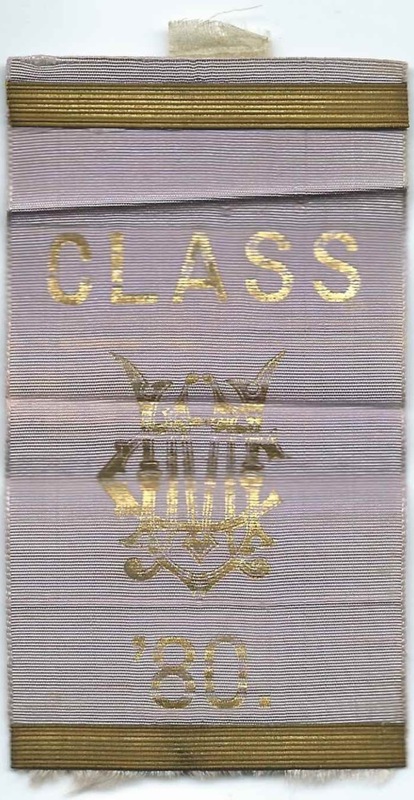 Shared the page with his brother Manford E. Gaspar of Surry, Maine. They were the sons of inscribers Willie Everett Gaspar and Evelyn Mary (Bemis) Gaspar. Philena Ellura Gaspar of Surry, Maine; inscribed on August 7, 1921. "age 26 years". Daughter of inscribers Willie Everett Gaspar and Evelyn Mary (Bemis) Gaspar. 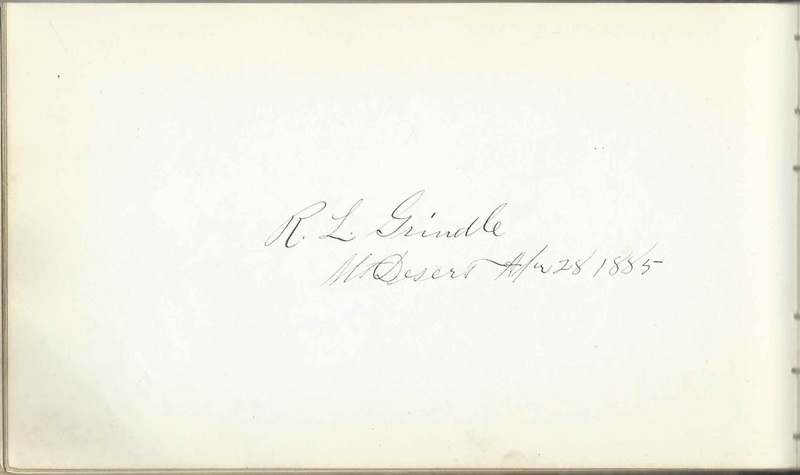 R. L. Grindle; inscribed at Mt. Desert, Maine, on April 28, 1885. He was Robert Lowell Grindle, whose wife Flora A. (Milliken) Grindle inscribed the right facing page. Flora A. Grindle of Mt. Desert, Maine. She was Flora A. 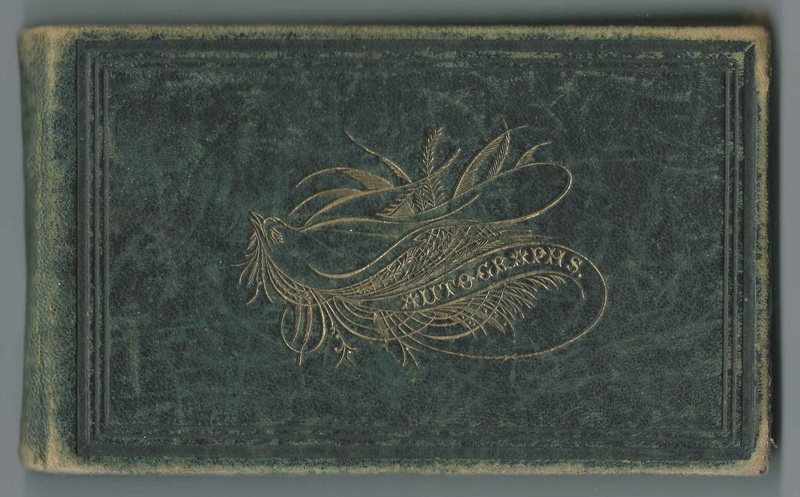 (Milliken) Grindle, wife of Robert Lowell Grindle, who inscribed the left facing page, and twin sister of album owner Frances E. (Milliken) Leverton. Joshua Grindle of Mendocino City, California; inscribed on June 7, 1889. Presumably the Joshua Grindle who was a brother to Robert Lowell Grindle, husband of Frances' twin sister Flora. Frank H. Hall of Livermore, Maine; "Pastor of M.E. Church Apr, 1901 to Apr. 1903". His wife Eveline F. (Kelley) inscribed the right facing page. Frank, born at Leeds, Maine, and Eveline, born at Chelsea, Massachusetts, were married at Stoneham, Massachusetts, on July 6, 1898. Eveline F. Hall of Livermore, Maine; inscribed on 4-10-1903. 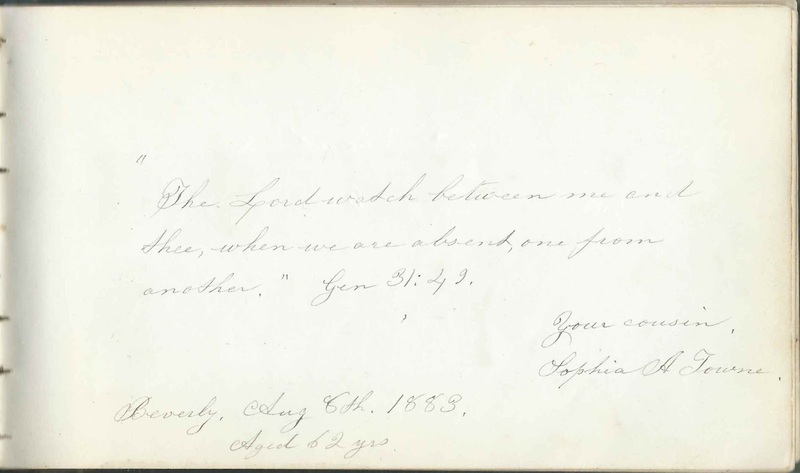 She was Eveline F. (Kelley) Hall, whose husband, Pastor Frank H. Hall, inscribed the left facing page. Frank, born at Leeds, Maine, and Eveline, born at Chelsea, Massachusetts, were married at Stoneham, Massachusetts, on July 6, 1898. M. J. Heath; inscribed on November 23, 1883. Willie H. Heath inscribed the right facing page. Willie H. Heath of Seal Cove, Maine; inscribed on July 13, 1883. M. J. Heath inscribed the left facing page. Fred W. Heath, "Age 13". His name and that of Victor A. Heath appear on a page inscribed in what appears to be the same handwriting on November 23, 1883 at Seal Cove, Maine. Victor A. Heath, "Age 5". His name and that of Fred W. Heath appear on a page inscribed in what appears to be the same handwriting on November 23, 1883 at Seal Cove, Maine. William W. A. Heath, "29 - 6 mos". Inscribed at Seal Cove, Maine, on November 23, 1883. "William Webster Allen Heath. 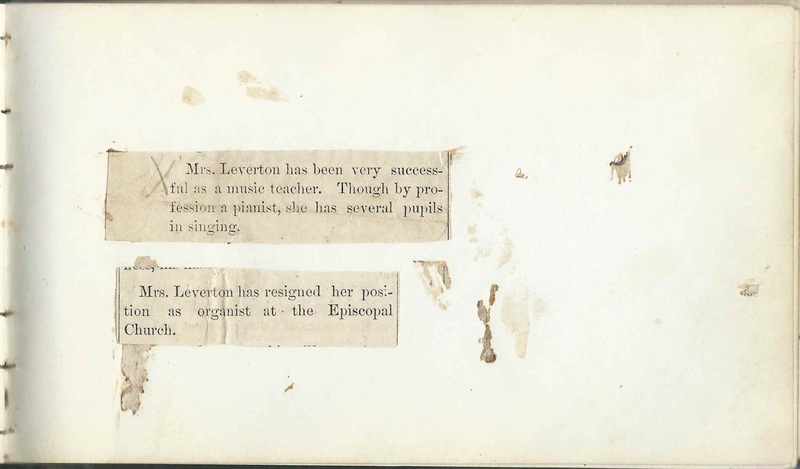 "We shall gratefully remember Mrs. Leverton as Louisa's & Julian's first teacher in music." His wife Alvena D. (McKenzie) Heath shared the page and included the names of her children Julian J. Heath and Louisa M. Heath. Alvena D. Heath. She was Alvena D. (McKenzie) Heath, who shared the page with her husband William William Webster Allen Heath; she included the names of her children Julian J. Heath and Louisa M. Heath. Eldora Lurvey Higgins of Indian Point, Maine; inscribed on March 17, 1925. Mentions date of January 22, 1858, which was the birth date of Eldora Maria Lurvey, who married Frank Lurvey Higgins in 1875. Willie W. Hill, "6 years and 7 months". 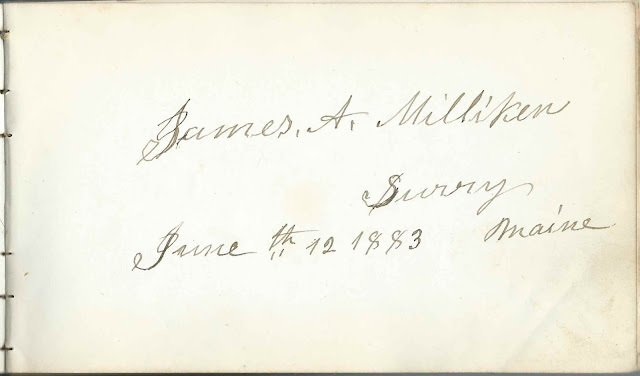 His name and that of his sibling Georgie J. Hill and cousins Freddie S. Millett and Annie C. Millett appear on a page inscribed at Beverly, Massachusetts, on August 16, 1883, presumably inscribed by their grandmother Sophia A. (Strickland) Towne, who inscribed the overleaf. Georgie J. Hill "4 years and 7 months". 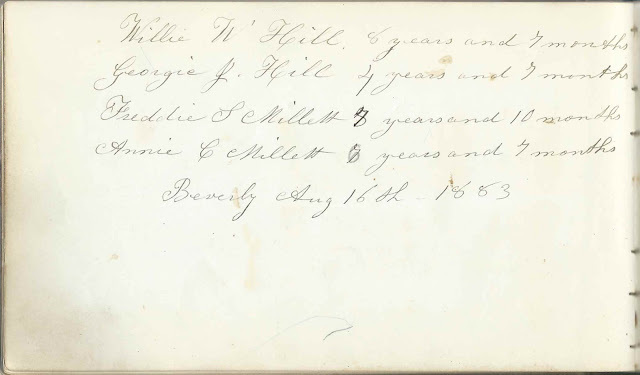 His name and that of his sibling Willie W. Hill and cousins Freddie S. Millett and Annie C. Millett appear on a page inscribed at Beverly, Massachusetts, on August 16, 1883, presumably inscribed by their grandmother Sophia A. (Strickland) Towne, who inscribed the overleaf. Myra N. Hodgdon of Seal Cove, Maine. She was Almira Norton (Ober) Hodgdon, "Myra", wife of Capt. John Faxon Hodgdon and mother of Annie S. Hodgdon. Myra's daughter Annie L. Hodgdon, "age 8", shared the page. Since Annie was born about 1874, the page was presumably inscribed about 1882. Annie L.. Hodgdon of Seal Cove, Maine, age 8 years. Annie Louisa Hodgdon, who was born about 1874, daughter of Capt. John Faxon Hodgdon and Almira Norton (Ober) Hodgdon, "Myra", who also inscribed the page. Since Annie was born about 1874, the page was presumably inscribed about 1882. Lillie Hutchings of Sedgwick, Maine; inscribed on December 25, 1883. "age 13"
Mrs. F. R. Kennedy of Portland, Maine; inscribed during a visit to Surry, Maine, on September 6, 1922. She was Mabel G. (Skillin), wife of Frank R. Kennedy and mother of Elizabeth Gray Kennedy, whose name appears on the left facing page. Miss Florence Knight. 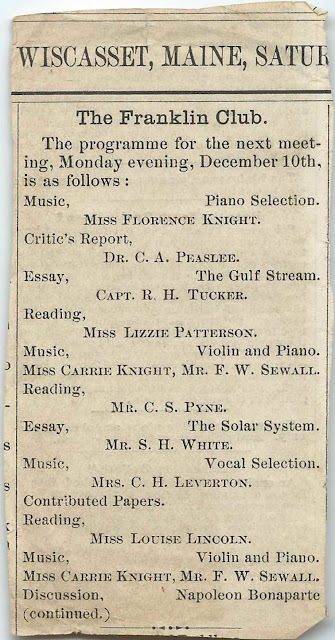 Name appears on the program for a meeting of The Franklin Club, with music and readings by Miss Florence Knight; Dr. C. A. Peaslee; Capt. R. H. Tucker; Miss Lizzie Patterson; Miss Carrie Knight; Mr. F. W. Sewall; Mr. C. S. Pyne; Mr. S. H. White; Mrs. C. H. Leverton [album owner Frances E. (Milliken) Leverton]; and Miss Louise Lincoln. Miss Carrie Knight. Name appears on the program for a meeting of The Franklin Club, with music and readings by Miss Florence Knight; Dr. C. A. Peaslee; Capt. R. H. Tucker; Miss Lizzie Patterson; Miss Carrie Knight; Mr. F. W. Sewall; Mr. C. S. Pyne; Mr. S. H. White; Mrs. C. H. Leverton [album owner Frances E. (Milliken) Leverton]; and Miss Louise Lincoln. Frances E. (Milliken) Leverton of Surry, Maine and other Maine places, album owner. Wife of Dr. Charles Henry Leverton, Several newspaper clippings about Frances and her husband are pasted throughout the album, and their names appear on several mementos tucked in the album..
Miss Louise Lincoln. Name appears on the program for a meeting of The Franklin Club, with music and readings by Miss Florence Knight; Dr. C. A. Peaslee; Capt. R. H. Tucker; Miss Lizzie Patterson; Miss Carrie Knight; Mr. F. W. Sewall; Mr. C. S. Pyne; Mr. S. H. White; Mrs. C. H. Leverton [album owner Frances E. (Milliken) Leverton]; and Miss Louise Lincoln. Molly Walker Macdonald. The Walker family inscribed "We appreciate the loyal cooperation you have always shown". Family members: Joseph N. Walker; Mary C. Walker; Ruth S. Walker of Mount Desert, Maine; inscribed on August 21, 1912; Charlotte Peyton Walker; Molly Walker Macdonald; Dorothea Walker; Paul Walker; and Samuel J. Walker. Freddie S. Millett "7 years and 10 months". 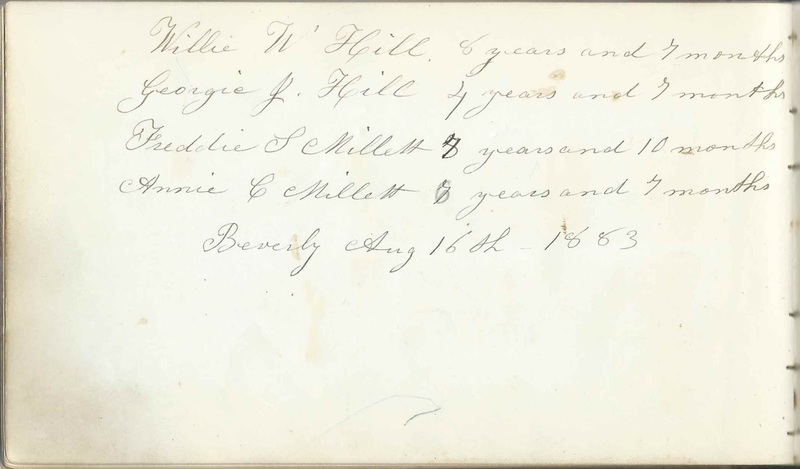 His name and that of his sibling Annie C. Millett and cousins Willie W. Hill and Georgie J. Hill appear on a page inscribed at Beverly, Massachusetts, on August 16, 1883, presumably inscribed by their grandmother Sophia A. (Strickland) Towne, who inscribed the overleaf. Annie C. Millett "7 years and 7 months". 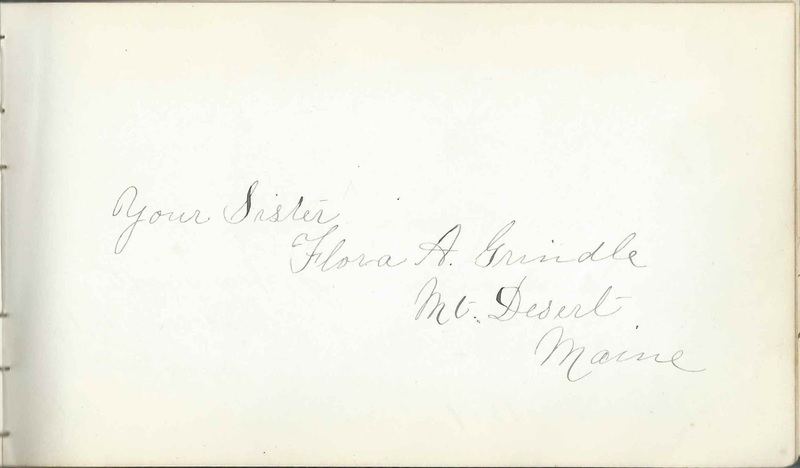 Her name and that of her sibling Freddie S. Millett and cousins Willie W. Hill and Georgie J. Hill appear on a page inscribed at Beverly, Massachusetts, on August 16, 1883, presumably inscribed by their grandmother Sophia A. (Strickland) Towne, who inscribed the overleaf. Flora F. Milliken of Surry, Maine; inscribed on May 1, 1885. Frances' niece. Flora was the daughter of Sarah Elizabeth (Phillips) Milliken and William Roland Milliken, who was the brother of album owner Frances. Flora was born about 1870. H. Augustus Milliken, M.D. ; inscribed on October 10, 1915. He was Howard Augustus Milliken, M.D. (1874-1953), son of album owner Frances E. (Milliken) Leverton's brother William Roland Milliken. Nellie B. Morgan of Sedgwick, Maine; inscribed on December 25, 1883. 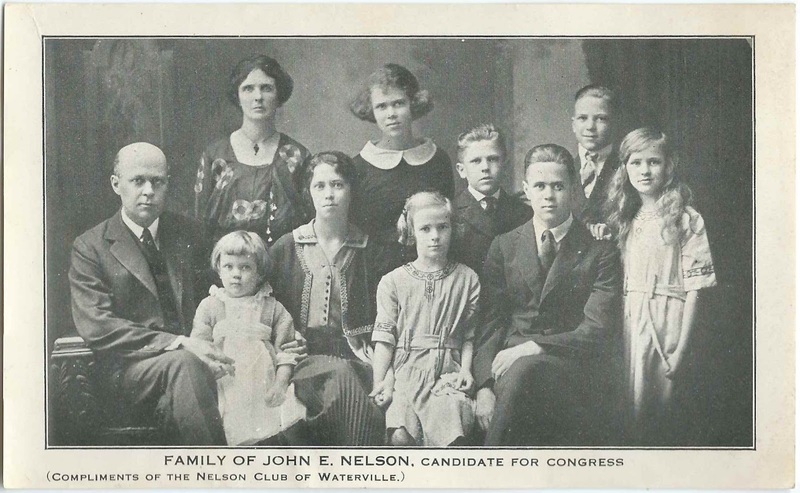 "Age 12"
John E. Nelson, Candidate for Congress; photograph of him and his family by the Nelson Club of Waterville. Miss Lizzie Patterson. Name appears on the program for a meeting of The Franklin Club, with music and readings by Miss Florence Knight; Dr. C. A. Peaslee; Capt. R. H. Tucker; Miss Lizzie Patterson; Miss Carrie Knight; Mr. F. W. Sewall; Mr. C. S. Pyne; Mr. S. H. White; Mrs. C. H. Leverton [album owner Frances E. (Milliken) Leverton]; and Miss Louise Lincoln. Dr. C. A. Peaslee. Name appears on the program for a meeting of The Franklin Club, with music and readings by Miss Florence Knight; Dr. C. A. Peaslee; Capt. R. H. Tucker; Miss Lizzie Patterson; Miss Carrie Knight; Mr. F. W. Sewall; Mr. C. S. Pyne; Mr. S. H. White; Mrs. C. H. Leverton [album owner Frances E. (Milliken) Leverton]; and Miss Louise Lincoln. Philip Pervear; inscribed at Sedgwick, Maine, on March 3, 1885. "This is My Name Philip Pervear I was Born in the town of Hampton Falls State of NH December 8, 1779 Am. Now 105 years old." Mr. C. S. Pyne. Name appears on the program for a meeting of The Franklin Club, with music and readings by Miss Florence Knight; Dr. C. A. Peaslee; Capt. R. H. Tucker; Miss Lizzie Patterson; Miss Carrie Knight; Mr. F. W. Sewall; Mr. C. S. Pyne; Mr. S. H. White; Mrs. C. H. Leverton [album owner Frances E. (Milliken) Leverton]; and Miss Louise Lincoln. Maria Russell Russell; inscribed on August 27, 1892, either at Wiscasset, Maine or at Barnstaple, Devon, England, both of which are mentioned. I suspect the former date, as other inscriptions in the album from Massachusetts occur on that date or in that time frame. Presumably Maria, of Barnstaple, Devon, England, was visiting at Wiscasset when she inscribed the page. Mr. F. W. Sewall. Name appears on the program for a meeting of The Franklin Club, with music and readings by Miss Florence Knight; Dr. C. A. Peaslee; Capt. R. H. Tucker; Miss Lizzie Patterson; Miss Carrie Knight; Mr. F. W. Sewall; Mr. C. S. Pyne; Mr. S. H. White; Mrs. C. H. Leverton [album owner Frances E. (Milliken) Leverton]; and Miss Louise Lincoln. 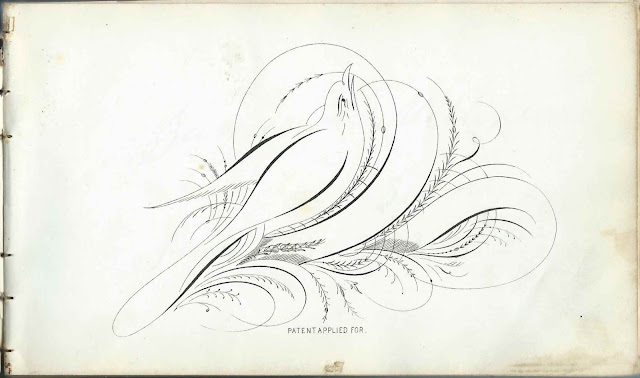 Hester Pratt Skillin of Freeport, Maine; inscribed on September 6, 1922. "Age 16 years." "I shall always remember the matches Aunt Fran tried to make for me in Surry." Lettie A. Smith; inscribed at Pretty Marsh, Maine, on November 25, 1883. Pretty Marsh is a village in the town of Mount Desert, Maine, located on the western coast of Mount Desert Island. Frances Sortwell of Cambridge, Massachusetts; inscribed on August 28, 1892. Frances Augusta Sortwell, whose sister Clara Sortwell inscribed the right facing page. Clara Sortwell of 335 Harvard Street, Cambridge, Massachusetts; inscribed on August 28, 1892. Her sister Frances Augusta Sortwell inscribed the left facing page. Edward Carter Sortwell of Cambridge, Massachusetts; inscribed on August 28, 1892. His brother Daniel Richard Sortwell inscribed the right facing page. Daniel Richard Sortwell of Cambridge, Massachusetts; inscribed on August 28, 1892. His brother Edward Carter Sortwell inscribed the left facing page. Lauretta St. John of Castle Creek, New York; inscribed on January 16, 1890, or June 16, 1890, but where the 9 in 1890 has been superimposed over what appears to be an 8, I'm assuming it was January 16, 1890. Sophia A. Towne; inscribed at Beverly, Massachusetts, on August 6, 1883. "Aged 62 yrs". Frances' cousin. She was Sophia A. (Strickland) Towne, wife or widow of Nathan Webster Towne and grandmother of the 4 children named on the overleaf: Willie W. Towne; Georgia J. Towne; Freddie S. Millett; Annie C. Millett. I believe Sophia and Frances were linked by their Tittle ancestors. Capt. R. H. Tucker. Name appears on the program for a meeting of The Franklin Club, with music and readings by Miss Florence Knight; Dr. C. A. Peaslee; Capt. R. H. Tucker; Miss Lizzie Patterson; Miss Carrie Knight; Mr. F. W. Sewall; Mr. C. S. Pyne; Mr. S. H. White; Mrs. C. H. Leverton [album owner Frances E. (Milliken) Leverton]; and Miss Louise Lincoln. Joseph N. Walker. The Walker family inscribed "We appreciate the loyal cooperation you have always shown". Family members: Joseph N. Walker; Mary C. Walker; Ruth S. Walker of Mount Desert, Maine; inscribed on August 21, 1912; Charlotte Peyton Walker; Molly Walker Macdonald; Dorothea Walker; Paul Walker; and Samuel J. Walker. Mary C. Walker. The Walker family inscribed "We appreciate the loyal cooperation you have always shown". 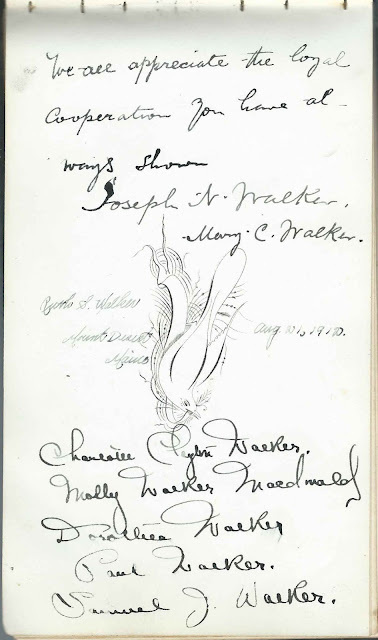 Family members: Joseph N. Walker; Mary C. Walker; Ruth S. Walker of Mount Desert, Maine; inscribed on August 21, 1912; Charlotte Peyton Walker; Molly Walker Macdonald; Dorothea Walker; Paul Walker; and Samuel J. Walker. Ruth S. Walker of Mount Desert, Maine; inscribed on August 21, 1912. The Walker family inscribed "We appreciate the loyal cooperation you have always shown". Family members: Joseph N. Walker; Mary C. Walker; Ruth S. Walker of Mount Desert, Maine; inscribed on August 21, 1912; Charlotte Peyton Walker; Molly Walker Macdonald; Dorothea Walker; Paul Walker; and Samuel J. Walker. Charlotte Peyton Walker. The Walker family inscribed "We appreciate the loyal cooperation you have always shown". Family members: Joseph N. Walker; Mary C. Walker; Ruth S. Walker of Mount Desert, Maine; inscribed on August 21, 1912; Charlotte Peyton Walker; Molly Walker Macdonald; Dorothea Walker; Paul Walker; and Samuel J. Walker. Dorothea Walker. The Walker family inscribed "We appreciate the loyal cooperation you have always shown". Family members: Joseph N. Walker; Mary C. Walker; Ruth S. Walker of Mount Desert, Maine; inscribed on August 21, 1912; Charlotte Peyton Walker; Molly Walker Macdonald; Dorothea Walker; Paul Walker; and Samuel J. Walker. Paul Walker. The Walker family inscribed "We appreciate the loyal cooperation you have always shown". Family members: Joseph N. Walker; Mary C. Walker; Ruth S. Walker of Mount Desert, Maine; inscribed on August 21, 1912; Charlotte Peyton Walker; Molly Walker Macdonald; Dorothea Walker; Paul Walker; and Samuel J. Walker. Samuel J. Walker. The Walker family inscribed "We appreciate the loyal cooperation you have always shown". Family members: Joseph N. Walker; Mary C. Walker; Ruth S. Walker of Mount Desert, Maine; inscribed on August 21, 1912; Charlotte Peyton Walker; Molly Walker Macdonald; Dorothea Walker; Paul Walker; and Samuel J. Walker. Mattie Warnock of Castle Creek, New York; "11 Years old"; inscribed on January 21, 1890. 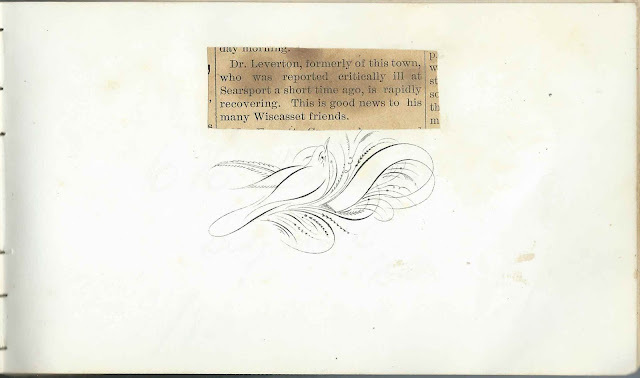 Shared the page with her sister Blanche Warnock; their sister Jennie inscribed the right facing page. Blanche Warnock "3 years"; very childish handwriting so perhaps written by Blanche herself. Shared the page with her sister Mattie Warnock; their sister Jennie inscribed the right facing page. Jennie Warnock; inscribed at Castle Creek, New York, on January 21, 1890. "14 years". Her sisters Mattie Warnock and Blanche Warnock inscribed the left facing page. Rev. Thomas R. Warnock, pastor of Castle Creek M. E. Church; inscribed at the Wyoming Conference. His wife, Lottie (Dimon) Warnock, inscribed the right facing page. Mrs. Lottie A. Warnock of Castle Creek, New York; inscribed on January 14, 1890. She was Lottie (Dimon) Warnock, whose husband Rev. Thomas R. Warnock inscribed the left facing page. Mr. S. H. White. 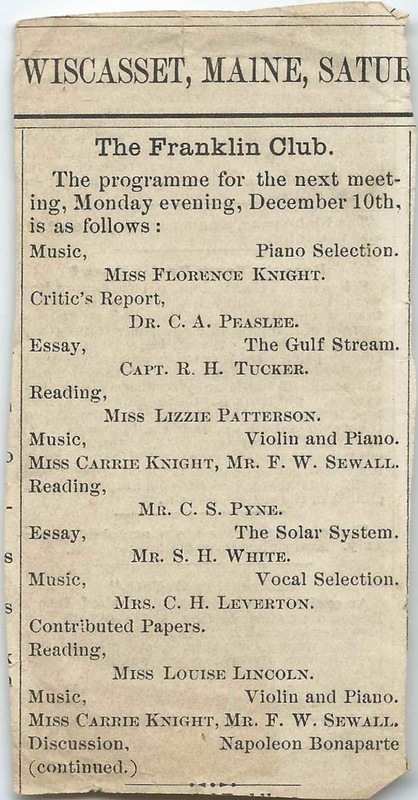 Name appears on the program for a meeting of The Franklin Club, with music and readings by Miss Florence Knight; Dr. C. A. Peaslee; Capt. R. H. Tucker; Miss Lizzie Patterson; Miss Carrie Knight; Mr. F. W. Sewall; Mr. C. S. Pyne; Mr. S. H. White; Mrs. C. H. Leverton [album owner Frances E. (Milliken) Leverton]; and Miss Louise Lincoln. James Augustus Millliken, 1816-1899, my 1st cousin 4 times removed. Son of James Milliken, 1792-1849, my 4th great uncle from the Milliken family, and Nancy Head Jarvis, 1796-1837, my 4th great aunt from the Jarvis family. Frances E Milliken Leverton, 1847-1932, daughter of James and Lydia. My 2nd cousin 3x removed. Willie Everett Gaspar, 1865-1945, son of Josiah Allen Gaspar and Philena Milliken. My 2nd cousin 3x removed. I'm so glad that you happened upon this post! Did you notice any errors that need correcting?